Diwali is Coming and with that, will the come one of the biggest shopping festival in India. Diwali has been one of the most prominent festivals in india which is widely celebrated and one of the biggest trademark of celebrating Diwali is “Shopping”. Also, this shopping season is further exaggerated by the fact that another prominent Indian festival “Eid” also comes along with Diwali. Both of these festivals are one of the biggest festivals in India and they both fall around same time. This time is considered as auspicious by Hindus and Muslims & they prefer to make major purchases around these festivals. As a result, sellers also try to exploit this period to maximum and they come with up with different discount and promotional offers. With the advent of online shopping in India, online shopping sites are already offering loads of promotional schemes. I have tried to consolidate some of these offers from prominent Indian ecommerce sites. snapdeal.com is one of the biggest online shopping sites in India. Similarly, you will find deals on every product listed on snapdeal.com like “Buy 1 Get 1 Free” offers on wide range of products. Amazon.in which is the Indian arm of the one of the biggest ecommerce website of the world is also offering great offers on variety of products. Just like snapdeal, they too offer great products at great prices with damn good services. Flipkart.com is the biggest online shopping site in India and don’t any introduction. 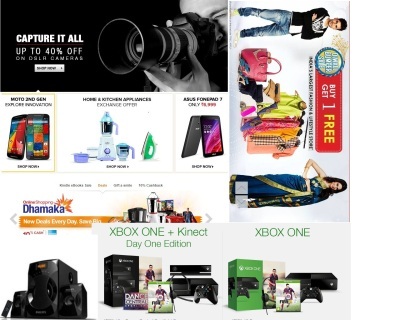 Just as above mentioned sites, flipkart is also offering great offers on wide range of products. Motorola Smartphones— Exclusive offers on Motorola Smartphones like Moto G and Moto X.
I have mentioned very few details about flipkart because they are offering discount on every product. You can visit their website for more details.